Thanks to Joe George, a descendent of Bluemont village’s founding father, William Clayton, we have received a reproduction of a historic meeting notice. The notice in the Genius of Liberty newspaper announces an 1817 meeting of the board of the country’s first operating turnpike, at Bluemont’s historic Clayton Hall. 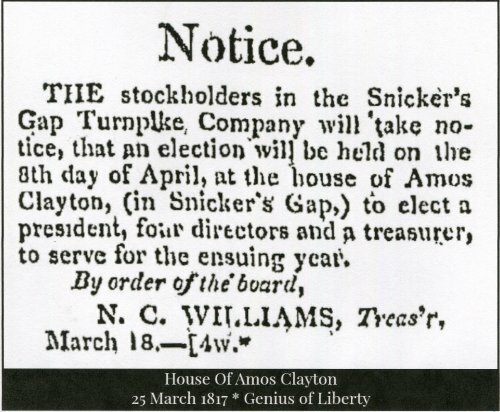 That the meeting of the board was held at Clayton Hall (the house of Amos Clayton) suggests that by the early 1800s Snicker’s Gap had become—not just the remote limit—but the center of gravity of what is now called the Snickersville Turnpike. Amos Clayton was the William Clayton’s oldest son, born September 22, 1769. Amos would have been 48 years old at the time of this notice. “The meeting of the turnpike company was probably held in the large double parlors that are to the left of the spacious center hall in the Amos Clayton House, or in the “Ballroom” that takes up the entire third floor. Refreshments were probably prepared in the kitchen that occupies a low ell adjoining the square house and has a huge fireplace, its own entrance to the kitchen garden, and a loft above for the three slaves the family owned.” (From Snickersville to Bluemont: The Biography and History of a Virginia Village, by Jean Herron Smith, Evelyn Porterfield Johnson, and Robert Hoffman, p. 25, available from Friends of Bluemont). Clayton Hall is still a gracious old stone Virginia family home. That the meeting of the board was held at Clayton Hall suggests that by the early 1800s Snicker’s Gap had become—not just the remote limit—but the center of gravity of what is now called the Snickersville Turnpike. By the 1817 meeting, the “Snicker’s Gap Turnpike” had been operating 31 years. Just 6 years after it began operating, in 1792, Amos’ father William Clayton had purchased his 624 acre tract on the southeast side of the mountain in what is now the Bluemont area. The Snickersville Turnpike had opened in 1786, the first result of an infrastructure project of the Virginia General Assembly. In 1785, the General Assembly had passed a law appointing nine commissioners (what we would now call a nonprofit turnpike trust), instructing them "to erect, or cause to be set up and erected, one or more gates or turnpikes across the roads, or any of them, leading into the town of Alexandria from Snigger's [Snickers] and Vesta's [Keyes—now Route 9] Gaps." We are grateful to Joe George, who comes down from Amos’ son Charles Fenton Clayton, and lives in Missouri, for this reproduction of the notice.